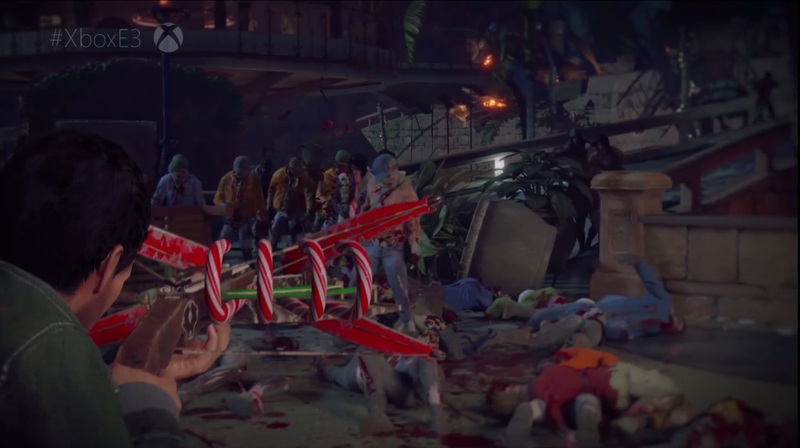 While someone crept down and peaked at their present early this… er June… the whole package was finally unwrapped this Microsoft E3 presentation, and we were all given the gift of Dead Rising 4. ‘I’ve covered wars, you know‘ Frank West is back for this new sequel that looks like it wants to go back to the craziness that was the first game. The mall returns along with insane weapon combinations, costumes and some new tricks. Vehicular zombie-slaughter is also back and more gonzo than ever. And, at the center of all the action, our hero is hanging out by a tree with grotesque ornaments playing with social media on his phone and taking selfies. Maybe this hints at a lot of mobile apps in-game that you can use to record and help your massacre of the undead. What is clear is that this will be a holiday game through and through. Christmas settings, an end-of-2016 release window for Xbox One and Windows 10, and fake snow falling in the theater while the trailer played in Los Angeles all wrapped this overused metaphor with a neat little bow.